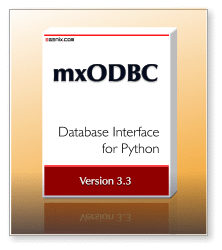 eGenix is pleased to announce the immediate availability of eGenix mxODBC™ 3.3.6 - Python ODBC Database Interface, with many advanced Python DB-API extensions and enhanced support of stored procedures with input, output and input/output parameters. Available for Python 2.4 - 2.7 on all major platforms. The mxODBC default *RowFactory helpers will no longer try to add column names which are not valid Python identifiers to the Row class code. Such columns are still available via index (e.g. row) or named access (e.g. row['123']). IMPORTANT: Fixed a bug in context managers not properly detecting exceptions. This resulted exceptions getting silenced, transactions not getting committed and could lead to data corruption. Thanks to Jan Murre for the report.